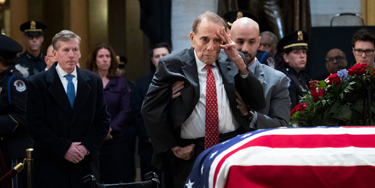 2 Feedbacks on "95-Year-Old Bob Dole Gets Out of Wheelchair to Stand and Salute George Bush"
We kneel to no one but the Lord, our God. Watch him and think of the effort it took to do that. Because that’s what military men do. Whatever it takes. Sadly, that’s a generation the likes of which we’ll not see again.